Very Original, Handmade Australian Shilling Coin Cufflinks + Stitched Black Gift Box. Perfect gift for the man who has everything. Iconic Cufflinks for the esteemed gentlemen. Hand crafted cufflinks, made with genuine silver shilling coins minted in the Commonwealth of Australia featuring the magnificent Ram’s Head on the obverse. Comes with its own personal history – each coin has unique blemishes from a life spent in circulation – if only they could talk! These Shiny Silver Shilling Coin Cufflinks are truly stunning statement pieces in themselves. A striking choice popular with the more confident among our clients. Their historical significance can’t be surpassed in this nation as they were the very first Commonwealth coins to be circulated in Australia. They have beautiful Rams Head on the ‘tails’ side where the ‘head’ really depends on the year. The majority of our series however, still have a young Queen Elizabeth on them. Originally these Australian Shillings were minted at 100% silver but were debased to 50% silver in 1946 to help in pay back the massive war debt. Coins are in excellent condition, considering their popular circulation, but they were treated in a rather precious way back in their day and we have just restored them and brought them to life again in our master crafted cufflinks. These come presented in a classy gift box, and are backed by our 3 year warranty. Each set of Australian Shilling Coin Cufflinks is handmade – Ensures that every pair is as individual as the person wearing it. High quality silver plated toggles – Expertly soldered to the coins. We use metal solder (not glue). We pride ourselves on making quality, durable cufflinks so that they will look great for years to come. These are the best quality Australian coin cufflinks in the world! We also offer a 7 day return privilege. We want you to be completely satisfied with your new Australian Shilling Coin cufflinks! Originally the Shillings that were circulating throughout Australia were actually minted in the UK directly (between 1910 – 1915) bearing the effigy of Edward VII. By 1916 the Melbourne mint assumed the manufacture of most shillings. Sydney assisted with the minting of shillings from 1922 to 1926 when the Sydney Mint then closed down. In 1921 shillings were struck in Sydney. These coins have a star above the date but it is not a mintmark. The star was intended to signify a change in silver content but the change never eventuated. The Melbourne mint did strike 1,122,000 shillings in 1921 but they were all dated 1920. 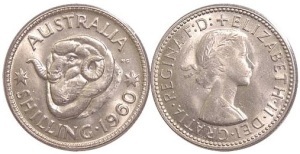 Melbourne took over sole minting of shillings from 1927 to 1941. Australian Shilling Coin Cufflinks are the ideal birthday, anniversary, wedding or corporate gift. Click the button below to add the Australian Shilling Coin Cufflinks to your wish list.